So far I'm pretry impressed with this unit. This headset is currently paired with a Blackberry 8800. 1) Audio - ...is stellar. Yes, its prone to interference, but I've yet to see a unit that doesn't occasionally give you a bit of static (JX10 - I'm looking at you!). Callers were impressed to hear that I was using a headset. 2) Pairing - I've always thought this process to be a bit obtuse, but I guess it drives down costs to have the much-vaunted "multi-funtion" button. I find it annoying. That said, pairing was quick and easy with this unit and it **stays** paired for hours at a time. 3) Fit - Stays paired and stays in my ear for hours at a time. Does it hurt? Heck, even my ears can't stand canalphones. I stand at 6 feet and yet I have the earcanals of a 5 year old, I guess. I don't have a problem using this set all day, but my ears are still a bit sore. Still, this is much better than other models I've used (JX10 - I'm still looking at you!). For the record, I'm using the smallest gel. The WEP200 gives you three different sizes. 4) Price - one of the cheapest BT headsets around. I've tried expensive, I've tried cheap, I've tried middle of the road. So far, the WEP200 beats em all, even when not factoring in the cost. 5) Range - doesn't matter what side of my body this unit is on, it almost always makes a clear connection to the BB 8800. I also use this unit to take VOIP calls via Cisco IP Communicator on my Dell D620 laptop and iChat audio on my Macbook Pro. It gives you just enough freedom to roam. You start loosing your signal at about twenty feet in clear line of sight. 1) Size - Unit is super tiny! It gets lost in my shirt pocket, my jacket pocket, left on the counter. Annoying when you are getting a call and your headset is still paired to your mobile. Its never a fun scramble, especially when someone important is at the other end. "Hang on a second! I need to find the headset!!!" 2) Charger - Not thrilled about the charger/carrying case, but if it helps keep the size of the headset down, I can't complain too much. I feel compelled to get my wife to buy one, just so we'd have two chargers around the house - one for upstairs and another downstairs. They're cheap enough, so why not? Overall, this is the best BT headset I've ever used in the three years that I've been using them. Good show, Samsung. The WEP200 is great for people who wear glasses because there isn't an extra hook that goes over your ear. The tiny loop on the WEP200 earpiece is flexible and does a good job of hooking or bracing the unit in your ear. You can also rotate it to fit it in your left or right ear. I've been able to freely talk and move my head around without feeling like the headset would fall out. The battery life seems to be shorter than my Plantronics Voyager 510, but it's understandable with the much smaller size of the WEP200. I really haven't had an issue with the battery, as long as I remember to take it out of the car with me to charge overnight or during the day. I have to take it with me because, as of March 2008, there doesn't seem to be a car charger accessory for this headset. Update May 2008: As M. Cirone points out in the comment below, there are now car charger accessories available for the WEP 200! The sound quality isn't as good as my Plantronics Voyager either, but it's still good enough for phone calls. People on the other end don't seem to have problems understanding me and I can hear them well enough. The buttons are big and easy to reach, but take a little bit of force. Since the headset is so small though, it's easy enough to hold it in place while you press buttons. I also had no trouble connecting this headset to my Nokia 6300 phone. In fact, I can switch between this in my car and my Plantronics at home without any issues. Overall, this is an excellent, inexpensive headset, especially for people who wear glasses. It's definitely tiny though so it's very easy to lose if you're not careful. I purchased this headset a while back and have used it consistantly while on the road with my Pocket PC phone. It certainly has some pros and cons. 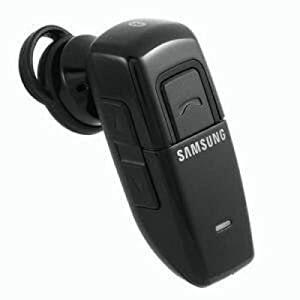 I love the size and convenience of this Samsung unit and it comes with different size earpieces but depending on your shape of ear it does not hold snuggly. I am not able to keep it in my ear for extended periods because it begins to come loose and falls out - especially if you're walking or moving a lot. I end up placing it in my shirt pocket until I need it which actually works well since you don't have to have an "attachment" on you all the time. The problem is that I have to twist it to get the best hold and over time it has irritated my ear to the extent that I constantly have peeling skin in the area that it contacts. In an effort to be completely fair, I have let my wife fit it in her ear and it holds much better without twisting. My ear is a little bit larger where the unit fits in. So regarding fit, it is probably hit or miss depending on your ear shape and size. With the current price it's definitely worth a try because everything else about it is pretty good. Update: There is a good solution available for the irritation problem. Remove the OEM earpiece and install a Jabra Gel earpiece. The Jabra Gels come in 3 sizes for different sized ears. They fit snuggly so repositioning is not necessary and you don't get skin irritation inside the ear. A couple of positive side effects of the Jabra Gel's are that they block out ambient noise and funnel the sound so the volume level is higher. Note: you need to remove the Jabra Gel when you recharge the unit - but it's simple enough.